When I think of the rolling golden hills around Palo Alto, I think of broccoli salad. Not estates complete with horses, not perfectly tanned and perfectly fit weekend riders stopping for a cappuccino while their carbon fiber bikes rest along the decorative fencing enclosing the cafe patio, not the vast expanse of ocean just off to the west. Nope, I think of broccoli salad. The heavy mayonnaise-loaded kind with bacon, cheddar and raisins. The kind that really belongs at a church potluck in the midwest. It’s because of the darn way I have a near full-on emotional break-down if I get overly hungry or overly tired. And you don’t want to see what happens when I’m both. It’s not pretty. Last summer when we were in California for a friend’s wedding, I had, shall we say, a little more trouble adjusting to the three hour time difference than anticipated. The fact that on the day I arrived in the Bay Area, I had gotten up at 4am Eastern Standard Time to catch my flight, didn’t actually make it to San Francisco until 14 hours later because of delays along the way, and then didn’t get supper until nearly 10pm West Coast time (which my body still strongly believed was 1am, and took great pains to remind me of this) somehow didn’t set me up for an auspicious start to the weekend. Then, for the next two and a half days I found myself having to be on constant alert for that hair’s breadth of time between being a happy, functional human being and turning into a petulant, weepy toddler who couldn’t understand why she couldn’t just have what she wanted (that being either food or a nap) right at that very instant. If I can sense that moment and swoop in with a snack just in the nick of time, the day can be saved, and all will once again be right with the world. One of these moments (I’ve had friends who call them “code red” moments, which really says something, I think. Potentially something embarrassing. But, what can you do?) hit as we were driving to the vineyard where the wedding was to be held. No amount of scenic landscapes, lush vines, or glowing afternoon sunshine were going to be able to distract me. And to make matters worse (or perhaps better, when it comes to these cases) Joel was in the same boat. We needed to stop! So, we pulled off into a quaint little town that looked like it belonged in a movie set (as did the people lounging about on the restaurant patios), and stormed the market. Rows of organic fruits, antioxidant drinks, and gluten free snack bars held no appeal. An internal honing mechanism that turns on only in moments of low blood sugar had activated, and I made a mad dash straight to the deli counter and ordered the heaviest, goopiest looking thing they had, their broccoli salad. In that moment, it was heaven. And, more than satiating enough to keep me going for the next several hours until dinner. A few days ago, I found myself craving broccoli salad again. I started a pot of broccoli steaming, and about halfway through I suddenly realized that since that trip was the only time in my life I’d ever actually eaten broccoli salad, perhaps what I was actually craving was a vacation to somewhere where the streets are paved with sun, cappuccinos, and weekend cyclists (don’t think about that image too hard, please). I felt slightly thwarted in my plan. But, instants later, I decided that attempting a slightly less oily, goopy, sticky reworking of a broccoli salad wasn’t a half bad idea in its own right. I drained the broccoli, put the mayonnaise and bacon back in the refrigerator and started lining up some other ingredients. 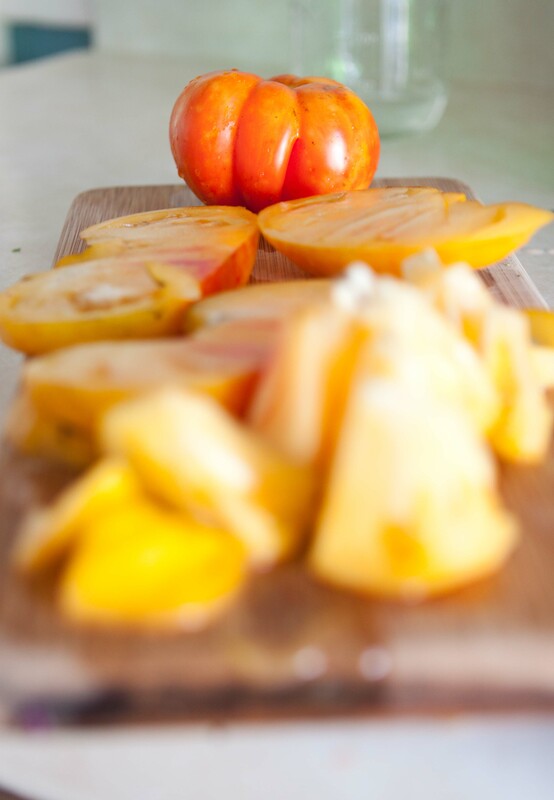 A couple of beautifully ugly heirloom tomatoes, a perfectly ripe avocado, a blazing yellow little lemon, a perky bunch of cilantro, a handful of pepitas. In moments, a salad was born, a fresh and lively one, much more like what the atmosphere and scenery of those Californian hills had actually been like. And, one that didn’t give me a stomachache an hour later, which my original plan certainly would have done. The lightly steamed broccoli florets are sturdy under your teeth while the tomato is sweet and juicy, the avocado silky. The pepitas add a happy crunch. This slightly unusual combination of ingredients is bound together by a wonderfully lemony dressing with a hint of creaminess and a good dose of fragrant cilantro (feel free to use parsley or basil if you prefer). I also threw in some red onion, but let it stand in the lemon juice first to tame its bite and mellow it out. This is one of those salads that could be a side dish, but which could also easily become a main dish with the addition of some crumbled feta, shredded chicken, fried tofu, cooked beans, or some toasted almonds. It was delicious, and I think I’ll be returning to it for as long as we can still find edible tomatoes. 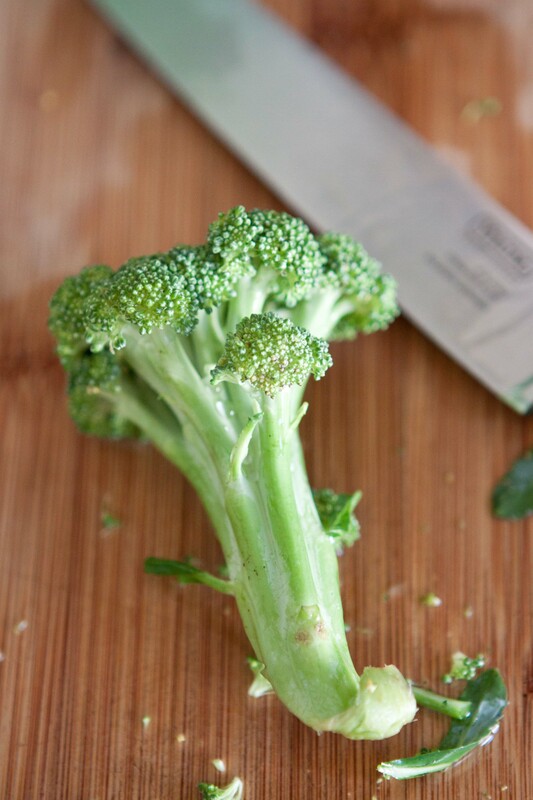 And after that, well, I may yet give a traditional broccoli salad – with some tweaks – a try. In a medium-small bowl, combine the onion, lemon juice, and a generous pinch of salt. Set aside and allow the onion to sit for at least 15 minutes. Put the broccoli florets in a pot, add a couple of inches of water. Put over high heat, cover, bring to a boil and cook until the broccoli is bright green and just getting tender, just a few minutes. Drain and set aside to cool briefly. Put the tomato pieces in a large bowl. When the broccoli is slightly cooled, add it and the cilantro. Whisk the olive oil and creme fraiche into the onion and lemon juice mixture. 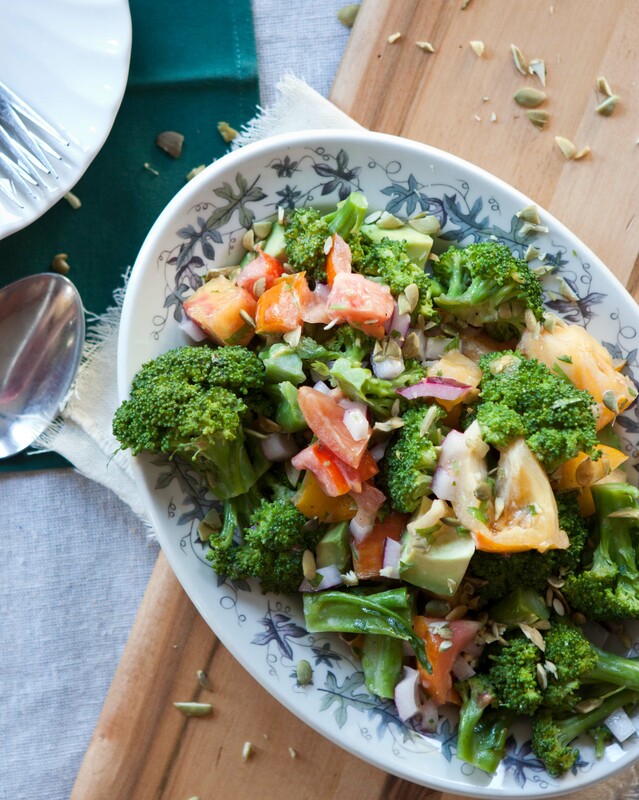 Toss the broccoli and tomato mixture with this dressing. Then, add the avocado pieces and carefully stir to mix them in without totally smashing them. Taste and add salt and pepper to your liking. Before serving, sprinkle with the pepitas. I love all things broccoli! This salad looks super yummy. I am glad I came across this post. Thank you! My husband is an absolute broccoli fiend too, so I’m always looking for new things to do with it! Let me say this, Broccoli and avocado are little presents from God! 🙂 Enough said. This sounds great. I happen to have a broccoli and a perfectly ripe avocado that I was wondering what to do with. Thanks for sharing your story. Sounds like you had a great lunch with the broccoli salad. looks super, just love the photo. Nice post. Thank you! I did rather enjoy my lunch! I love your blog! And I want to make this! But do you have a suggestion for an alternative dressing without dairy? I’m not sure what would go well with the broccoli. Thanks Vanessa! That’s a great question. You could try using mayonnaise (or nay-onnaise, if you’re going for vegan) to make the dressing creamy. You could also try blending in a little tahini or almond butter to add some creaminess. Or lastly you could try whirring the other dressing ingredients with some soft tofu or even more avocado in a blender. All of these would change the flavor of the dressing, but I think it would still be very tasty. Thanks Emily! I really appreciate your suggestions. You’re awesome! I’ve been looking for a way to get some broccoli on my table this week and this will be perfect. 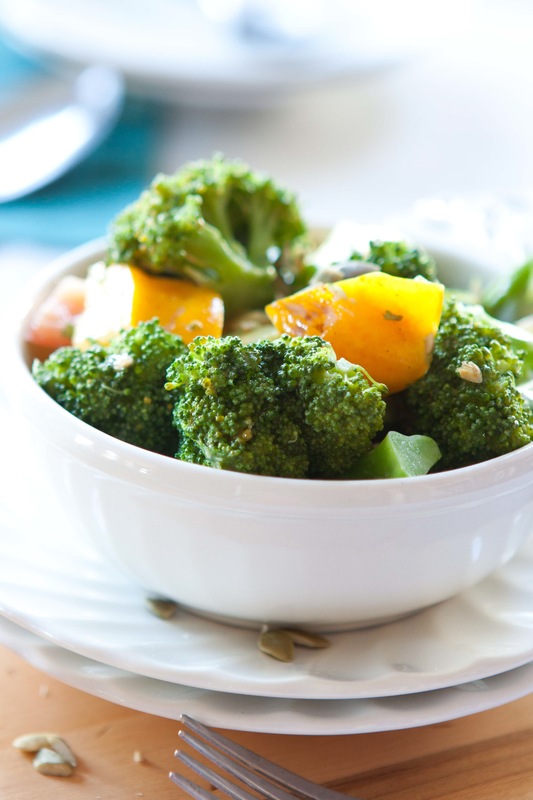 I love the idea of a “lightened up” broccoli salad. Thanks for sharing! 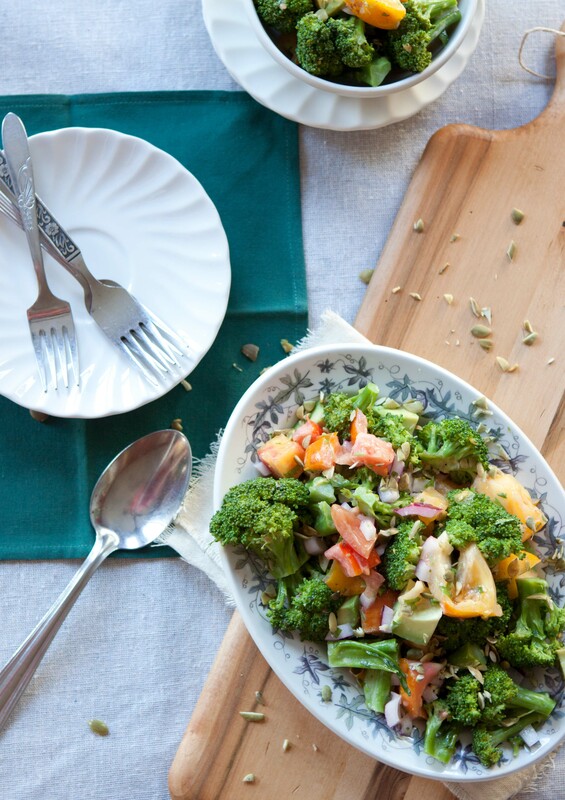 You are currently reading Broccoli Salad with Avocado and Tomato at Five And Spice.